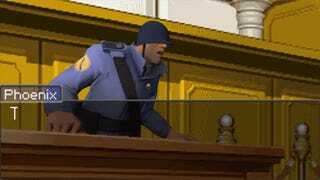 Team Fortress characters in Ace Attorney's courtroom sure is one of the weirder Gmod mashups. YouTuber TFHK's video has almost all the Team Fortress 2 classes represented and yet it still somehow makes sense, even though it's just for laughs. Here's the full clip. The Heavy makes a really good judge by the way.